In the Spring of 2001, as I was sitting at my desk at the National Center for the Blind, I received a telephone call from a person (Steve Hegedeos) who said he was the executive director of NAC (the National Accreditation Council for Agencies Serving the Blind and Visually Handicapped). (This was the original name of NAC. At our 2001 Convention NAC officials informed us that the new name--fairly recently adopted--is the National Accreditation Council for Agencies Serving the Blind and Visually Impaired.) He asked if he could come to see me. I had never heard of Steve Hegedeos, but I had a very long acquaintance with NAC. In the late 1960's NAC came into being. Immediately after its formation it tried to gain control of all work with the blind. It did this in the name of accreditation. NAC said that it would be very important for people to know what agencies for the blind were doing good work and what agencies for the blind were not. It set itself up as the official accrediting body to say to the public that those good enough to achieve its accreditation were of the first quality and everybody else was second rate. Of course there were problems with this summation of the NAC purpose and practice. NAC-accredited agencies often took advantage of the blind. NAC gave its seal of approval to those that paid less than the minimum wage to blind workers. It accredited schools where child abuse occurred. It systematically ignored the views of blind consumers. The whole business of NAC accreditation would have been an unimportant though very cruel hoax if NAC had not sought to require all funding for programming for the blind to be conditioned upon its seal of approval. The National Federation of the Blind sounded the alarm and called the blind of America and their friends to oppose the establishment of a system that sought to institutionalize practices to exploit blind workers, students, and clients for the benefit of administrators of programming for the blind. Beginning in 1972, the National Federation of the Blind declared that it would track down NAC wherever it went and expose its unethical, shabby behavior. Public protests were mounted; cover-ups were revealed; and unethical practices were laid bare. A group of NAC board members gathered in a room to create a list of Federation members they intended to ruin. It was all in the name of assuring quality services to the blind, they said. If they could stop the Federation, there would be no impediment to their taking high salaries while paying a pittance to blind workers who were required to do their work with broken machinery in substandard working conditions. This is the background of NAC as I had come to know it. Consequently, the telephone call from Steve Hegedeos raised questions in my mind. NAC had once been a serious threat to the future of programming for the blind. However, its influence had diminished and almost disappeared. What could NAC possibly want? Steve Hegedeos said that he would like to come to see me, and I invited him to the National Center for the Blind. Sometime later we talked for an afternoon about the purpose, the history, the practices, and the influence of NAC. I reviewed the events of the past in some detail, and I indicated to Mr. Hegedeos that I thought his joining the staff of NAC was a mistake. He said that he was just then becoming part of NAC, and he was genuinely interested in promoting quality services for the blind. I responded that I believed him, which is why I thought he should not join NAC. Nevertheless, I invited him to come to the convention of the National Federation of the Blind to make a presentation. Mr. Hegedeos came to the NFB Convention in Philadelphia in the summer of 2001. 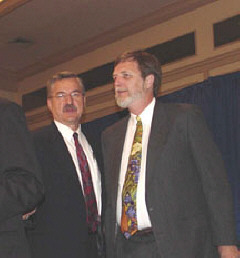 He brought Steve Obremski, President of NAC, with him. In their presentation they said that, although there had been problems with the accreditation process in the past, these problems were in the past. Messrs. Obremski and Hegedeos felt the National Federation of the Blind should forget the past and think about the future. They said that accreditation was important and that the organized blind should support it. We responded that we weren't sure that the past was so completely divorced from the future. The behavior of an entity in former times is not always a predictor of its future performance, but it is often the best indicator there is. I indicated that, if NAC wanted us to engage in further discussion of the matter, I would invite NAC to send three representatives to talk with three people from the NFB at a mutually convenient time. I said that I would serve as one of our representatives and that the others would be Second Vice President Peggy Elliott and Director of Governmental Affairs James Gashel. Messrs. Hegedeos and Obremski did not accept this invitation immediately, but later they did. Before the convention came to a close, a resolution reaffirming the position of the Federation regarding NAC was adopted. Although Mr. Hegedeos is not a member of the National Federation of the Blind and although he has no right to speak on matters of Federation business, he was permitted to address the convention regarding the merits of the resolution. He urged delay based upon his assertion that NAC was turning over a new leaf�-that NAC was becoming the quality-assurance entity that it had long claimed to be. The meeting between the NAC representatives and those of the National Federation of the Blind occurred on the tenth of September. I had invited the NAC officials to come to the National Center for the Blind, but they declined. They said the National Center for the Blind was not a suitable meeting place because it was not neutral. They insisted that we meet in a hotel. They set the time of the meeting and the place. We acceded to their demands. However, the implied assertion that meeting at the National Center for the Blind would somehow be improper helped to determine the tone of the gathering. Although Mr. Hegedeos had repeatedly offered friendship, his demand that we meet in what he called a neutral arena lacked the appearance of friendliness. Because there had been the assertion (even though only implied) that we were not to be trusted, we determined to record the meeting. Mr. Craig Gildner accompanied Federation representatives to the meeting for the purpose of recording it, and Mr. John Brennan came to serve as an amanuensis in case we came to an agreement which needed to be put in writing. Accompanying Messrs. Obremski and Hegedeos was Mr. Lee Robinson, a NAC Board Member and the Superintendent of the Utah Schools for the Deaf and Blind. After we introduced ourselves to each other, I outlined the problem with NAC as we in the Federation understand it. Specifically, we believe that NAC's accreditation does not assure quality service. Instead, it serves most frequently as a shield to protect some of the shabbiest practices of the worst agencies of the blind. When a blind consumer complains about poor service, the agency says that it has been checked out by the experts in the field and accredited. As an example, I asked if the President and Executive Director of NAC were aware of allegations of wrongdoing at the Utah Schools for the Deaf and Blind. Mr. Robinson said that he was aware of such allegations. I asked if Messrs. Hegedeos and Obremski were aware of them. Teresa Hansen was working as an aide at the Ogden Schools for the Deaf and Blind last year when she says she saw a teacher strike a blind, disabled boy--dislodging a shunt in the 4-year-old's head. In July the school administrators fired her, citing budget cuts. But Hansen's lawyer, Stacey Sullivan, contends her client lost her job because she told authorities about the abuse of Justus Johnstun. "There is no other explanation for the termination of Ms. Hansen's employment than illegal retaliation for her cooperation with the police in their investigation of the school," Sullivan said in a notice of claim served on the state in August. The notice is a prerequisite for Hansen's planned $500,000 lawsuit. On Thursday Doug and Amy Johnstun, the parents of Justus, filed a lawsuit in Salt Lake City's U.S. District Court against the school, the school's principal, superintendent, and the teacher who allegedly struck their son. The parents, who are also asking for $500,000, contend they should have been warned that his teacher had assaulted another student a year earlier. The Johnstuns say their son has undergone four surgeries to adjust his brain shunt, at a cost of $200,000. They also contend the abuse to Johnstun was not reported to police or state social workers until Hansen came forward. Justus's teacher, Charlotte Widdison, later pleaded guilty to class B misdemeanor assault. Superintendent Lee Robinson said, after the abuse came to light, Widdison was fired. "We believe that we acted appropriately," Robinson said. "What else can I tell you?" The lawsuit alleges other children have been mistreated at the school. It said the parent of another deaf student witnessed an aide kick a walker out from underneath a student as discipline. The student, who could not stand without assistance, fell to the floor. And a teacher allegedly tied another deaf student's legs to his chair because he was swinging his legs against it. A parent who volunteered at the school also said she frequently heard the teacher call her students "little s----s," the suit alleges. The teacher is still employed at the school, the suit states. Meanwhile, in the alleged whistleblower case, Sullivan says the school was advertising for three teacher's aide positions when Hansen was fired. School superintendent Lee Robinson said Hansen was invited to apply for any of the open positions. "Her position was eliminated because some classes were realigned," Robinson said. "But we told her she could apply for another job if she wanted to." But Sullivan says that Principal Dwight Moore told Hansen that, if she submitted her resume, he would "not recommend her for any of the positions." This occurred although Hansen had a "spotless" record, Sullivan said. In April Sullivan represented student Jimmy Sutton in his lawsuit against the school and Moore. Sutton was sexually assaulted twice in a week. Sutton's mother claimed Moore had failed to develop a plan to safeguard her son after the first attack. But a federal jury found that Moore did not act with "deliberate indifference" toward the boy. Following the reading of the article, Mr. Robinson asked whether we could confirm that there had been any convictions of illegal behavior at the schools. Of course we could not. However, the question posed by Superintendent Lee Robinson misses the whole point. It is not enough that the administration of a school avoid being convicted of illegality. Quality service demands a higher standard. If NAC is seeking to assure quality, it must have a system which can assure that the quality it is seeking really does exist. Not only does NAC fail in this department, its president and executive director were unaware that the allegations of misconduct had been charged. They were unaware of these allegations despite the fact that NAC had been conducting an on-site review of the school immediately prior to the time when our meeting took place. We asked that NAC look into the question of quality at the Utah Schools for the Deaf and Blind and report to us. The NAC representatives assured us that they would do so. That was in early September. The final days of the month came and went with no report. The weeks of October passed without news from NAC about the Utah Schools. In November we looked in the mailbox, but it remained empty. December found the mail basket equally bare. As this article is being written, the winter has come and passed away. The spring season is upon us, and still there is no report. NAC prints a document it calls The Standard-Bearer. The most recent of these contains the annual report of NAC for the fiscal year ending June 30, 2001. In this report NAC says that it came to our convention to invite us to participate in a reorganizing and restructuring of NAC. The invitation was couched in such terms that NAC's intention is perfectly clear. NAC wants to do as it pleases without accountability to the blind�-to the people it is intended to serve. In other words, there has been no change. The fundamental problem is that NAC intends to act without any check or balance system�-that it feels no obligation to a constituency. The blind have a right to determine their own futures, and agencies for the blind have an obligation to respond to the wishes and needs of those they are designated to serve. NAC wants to be able to tell the blind that, if it disagrees with their views, those views are irrelevant�-that the blind have no say-�that NAC knows more about blindness and the needs of the blind than the blind themselves know. This has been the fundamental problem with NAC from the beginning. Those who are to be served may not be ignored. The blind must and will have a voice in their own destiny. NAC is at the same old stand.